Enjoy fabulous curry recipes using our yogurt and find out more about our ‘Curry Nights at Home’ competition. It’s easy. The new ‘going out’ is cooking curry at home. “Simpler, healthier and tastier” say one pot guru @simplyfoodbymandy and award-winning Greek style yogurt producers ….. us. 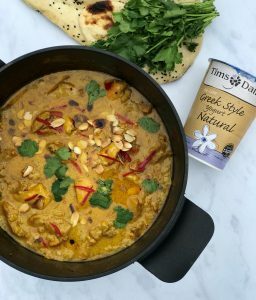 To prove our point, and encourage more people to do the same, we are running a campaign through October and November with Mandy’s gorgeous curry recipes which use our Greek style bio-live yogurt as an ingredient. There will be a new and tasty recipe idea each week in readiness for Friday night becoming “Curry Night at Home”. Suitable for all the family or for a supper with friends, Mandy’s recipes are cost effective, nutritious and very simple to cook. She also loves using our yogurt for anything from tenderizing marinades and making creamy sauces, dips, drinks and desserts; all with an Indian flavour and theme. 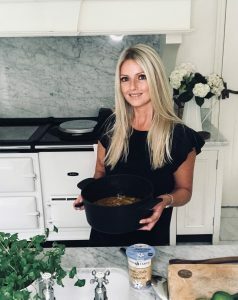 Check Mandy’s recipe for Chicken (or Tofu) Korma here and enjoy a curry night with friends and family at home.